Even with the NBA Playoffs just getting going this past Saturday, we’ve already seen some tremendous performances and major surprises. We’ve also seen a couple top-end title contenders choke away games. As the first round continues this week, we’re starting to notice some trends around the Association. Here, we check in on the top takeaways from the first four days of the playoffs. Los Angeles played Golden State tough for about two-plus quarters in Game 1 Saturday evening. It wasn’t until Stephen Curry decided to lose his mind that the defending champs pulled away. Game 2 was a completely different story. The Warriors opened up a 31-point lead about midway through the third quarter. That’s when a combination of struggles from the Warriors and some hot shooting on behalf of the Clippers that the road team pulled off the greatest comeback in playoff history. This series is now tied at one heading to Los Angeles. The top takeaway here being just how resilient Doc Rivers’ squad has been. After going scoreless in an upset home loss to the Orlando Magic in Game 1, Kyle Lowry and his Toronto Raptors did damage Tuesday evening. The point guard dropped 22 points on 8-of-13 shooting with Kawhi Leonard dominating alongside him. It was one of the better all-around performances of a largely ho-hum postseason career for the All-Star. This is something that Raptors fans have been waiting for ever since Lowry joined the team. He’s taking on less-than talent and should be dominating. While it is just the first round, Lowry’s Game 2 performance could act as a harbinger of things to come. Down 1-0 in their series against the San Antonio Spurs, Denver faced the real possibility of losing two in a row at home against the No. 7 seed in the Western Conference. That’s when Jamal Murray went off for 21 points in the final stanza to even the series against San Antonio up at one. Even then, it seems reasonable to suggest that these Nuggets are not as good as their No. 2 seed indicates. Losing at home against a Spurs team that boasted a 16-25 road record during the regular year magnified this to a T. Even if Denver is lucky enough to get out of Round 1, it would face a hellacious matchup, likely against Portland, in the conference semifinals. This team just doesn’t have the feel of a top-two seed. It’s that simple. Simmons looked like a liability on offense during Philadelphia’s surprising Game 1 loss to the Brooklyn Nets this past weekend. The former Rookie of the Year scored just nine points on 4-of-9 shooting from the field and missed four of his five free throws in the loss. The good news here is that Simmons stepped it up as the Sixers tied the series Monday night. He dropped a triple double with 18 points, 10 rebounds and 12 assists while shooting 8-of-12. Philly is going to need this with star big man Joel Embiid still hobbled to a knee injury. Embiid might be averaging 22.5 points and 12.5 rebounds per game thus far in the series, but he’s also played in a grand total of 45 minutes. It will be interesting to see how he looks heading into Game 3. It’s looking more and more like Portland’s series against the Oklahoma City Thunder could be the most lopsided of the four in the Western Conference Playoffs. After holding off Russell Westbrook and Co. by five points in Game 1, the Blazers absolutely handed it to OKC Tuesday night. Riding the hot shooting of C.J. McCollum and Damian Lillard, Portland outscored its counterpart by 20 points in the second half of Game 2. On the other hand, Westbrook had a night to forget in the Pacific Northwest. He shot just 5-of-20 from the field and turned the ball over six times. It’s becoming readily apparent that OKC is overmatched in the first round of the playoffs for the second consecutive season with Westbrook and Paul George leading the charge. This first-time All-Star might have struggled shooting the ball in Game 2 against the Sixers, but it’s pretty darn clear that Brooklyn has a star in the making. The Nets’ point guard is averaging 21 points and shooting nearly 40 percent from distance in two games against Philadelphia. We’re not sure if Russell’s performance is going to be enough to upset Philly. We’re not sure if the Nets have enough firepower. What we do know is that they stole homecourt from the Sixers with a Game 1 win. Russell played a major role in that victory. This has to be the biggest takeaway from the early part of that Eastern Conference Quarterfinal series. 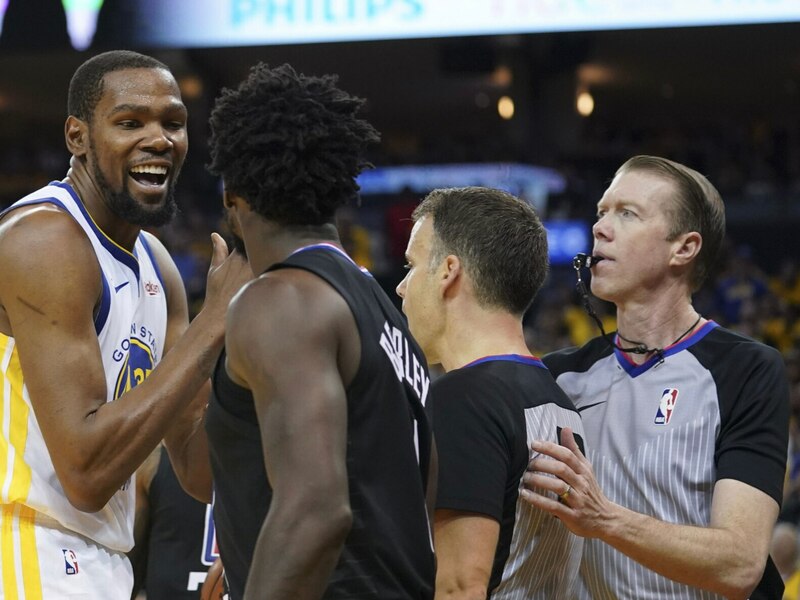 One could look at carelessness on offense and a lackluster defensive focus as two reasons why Golden State blew a 31-point lead at home Monday night. While both might be true, there’s a lot more to the team’s struggles than meets the eye. Game 2 saw Kevin Durant turn the ball over nine times while attempting only eight shots. It’s clear that Patrick Beverley is in his head. Another major issue here is head coach Steve Kerr’s rotation decisions. With Golden State holding a double-digit lead in the third quarter, he pulled Stephen Curry after the All-Star committed a fourth foul. Los Angeles ultimately got right back in the game with Curry on the bench. Now that DeMarcus Cousins is lost for the remainder of the season, we’re intrigued to see how Kerr’s rotations go from here on out. These have been two major factors in Golden State’s early struggles. No matter the physicality Andre Drummond thought he was bringing in Game 1 against Milwaukee, it’s apparent that Detroit just doesn’t have the firepower to keep up with Giannis Antetokounmpo and Co. That’s magnified with Blake Griffin being sidelined. Game 1 of the series this past weekend went as expected. The Bucks dropped the east’s eighth seed by 35 points with Giannis going for 24 and 17 boards. Milwaukee shot 49 percent from the field and dished out 31 assists. Look for this series to be over in four.